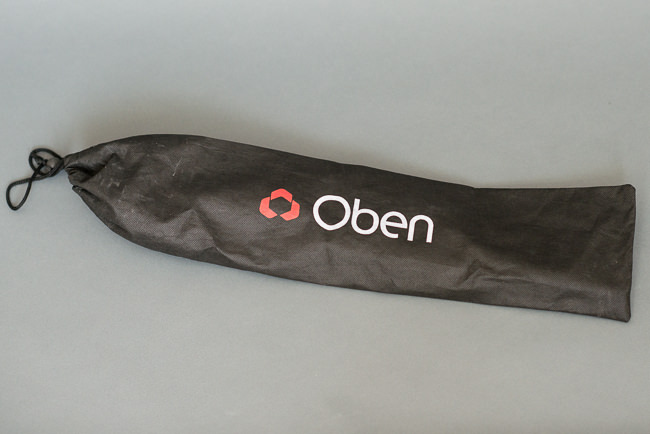 This is a review of the Oben CTM-2400 4-Section Carbon Fiber Monopod. I have often thought a monopod would be useful to have in low-light situations such as wedding receptions. There are times when there’s almost enough light to get the shot, but my shutter speed is low enough that I’m worried about motion blur. A tripod can be cumbersome, especially at a wedding reception, so a monopod seems like the ideal compromise between having a stable camera and not taking up a lot of floor space with a tripod. 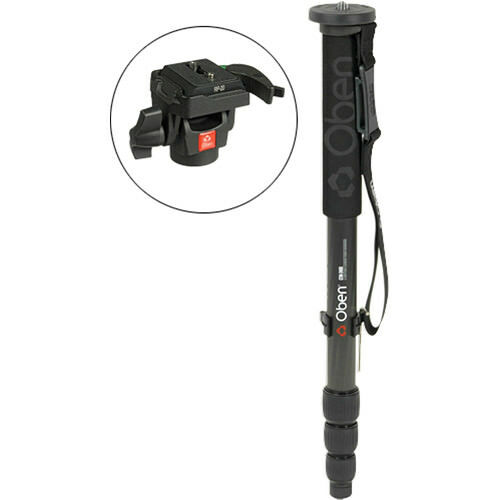 The Oben 4-Section Monopod comes packaged separately from the VH-R2 head. Both are packaged very well in attractive retail packaging. Included with the monopod are a carrying bag and an allen wrench. The head includes a quick release plate. I was initially impressed at how light the monopod was. 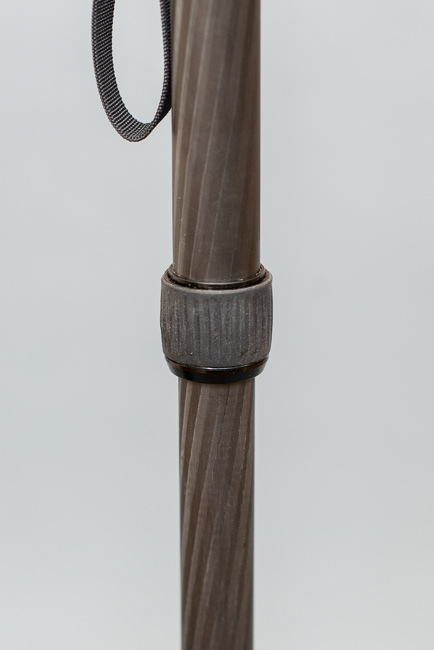 Carbon fiber is known for being a strong yet lightweight material and it definitely makes a difference in the weight of this monopod. As soon as I attached the head it added some weight to the monopod, yet it still has a nice balance when it’s extended to any length. 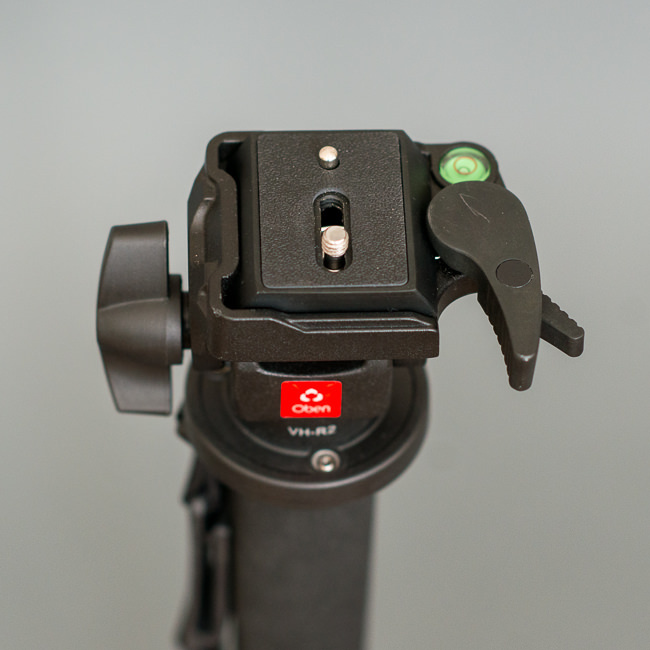 The sections extend very easily and smoothly, giving a feel of quality to the monopod. The section locks tighten easily and securely and prevent any slipping of the sections. This is important because you don’t want your camera height slowly changing over time as the monopod slowly collapses on itself due to slipping sections. 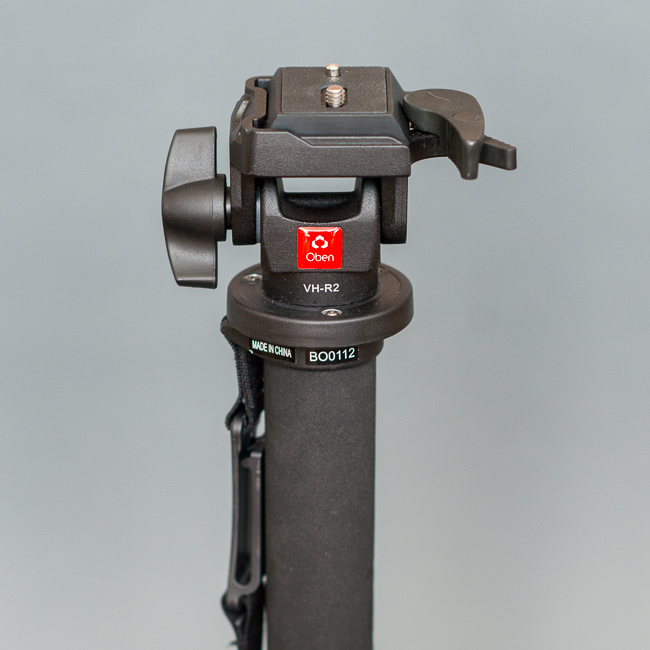 The top of the monopod has a foam grip that makes it easier to handle. It also insulates the monopod in cold weather so that your hand doesn’t get as cold while holding the monopod. The included strap and belt clip are nice features as well. The strap is large enough to put your hand through so that if you happened to let go of the monopod it wouldn’t fall. The belt clip is a nice feature as well if you don’t haven enough hands to carry everything and just want to clip the monopod to your belt or pocket. I do wish that the strap was removable, but there is absolutely no way to remove it without permanently cutting it off. One other feature that I thought was interesting was the retractable spike in the foot. Instead of the foot screwing up or down to cover or uncover the spike, the spike actually retracts into the monopod when you twist the foot. It’s a really cool feature, but one that I hope isn’t overly complicated. My worry is that over time dirt will get into the retracting mechanism, making it hard to use. I don’t know that this will ever happen, but it seems like a possibility to me. 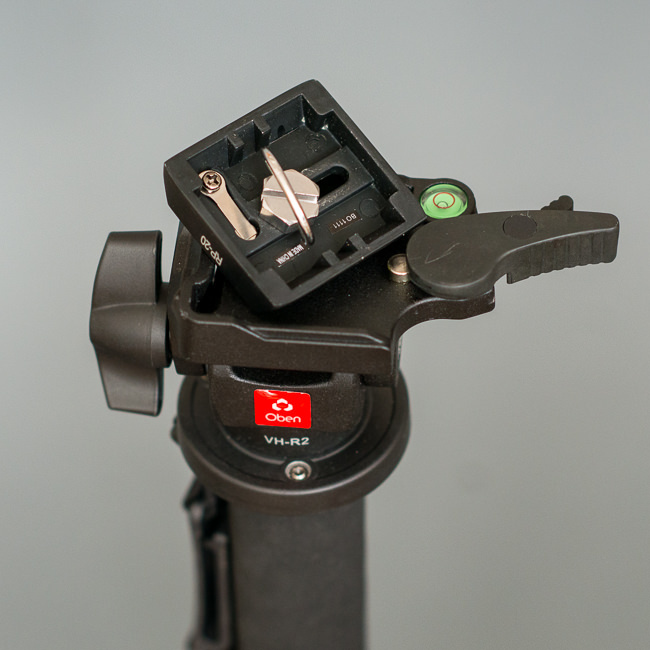 The VH-R2 tilt head is quite simple and easy to use. It has only one direction of movement and locks very securely if you don’t want it to move. It also comes with a quick-release plate, which makes it very easy to quickly move between shooting on the monopod and shooting without it. 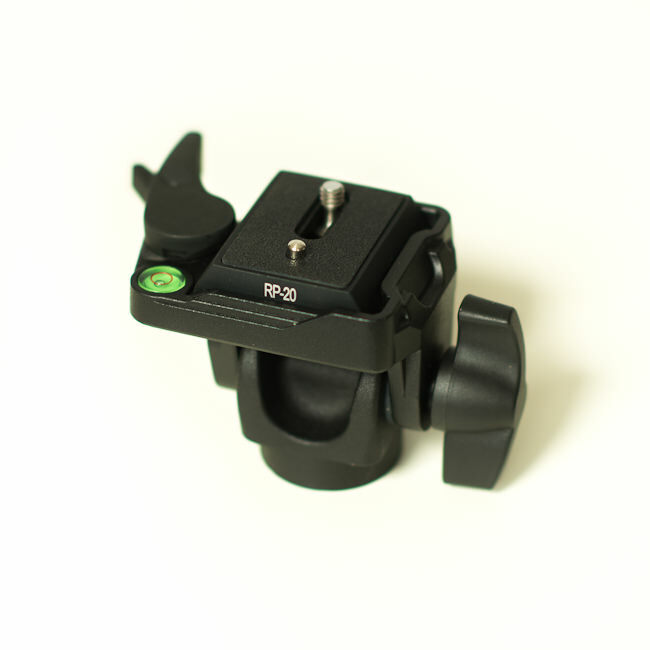 The quick release plate has a large folding loop on the screw that makes it easy to attach to your camera without the use of special tools. Although I didn’t try it, I’m sure you could probably even attach it while wearing gloves. The head also includes a spirit level. Although it looks like it would be easily covered up by a DSLR body, it’s actually quite visible at all times. Using the monopod to shoot photos was very easy. I did find that I was able to shoot at lower shutter speeds while using the monopod than I normally could shoot handheld, but it’s definitely no replacement for a tripod. Shooting at very low shutter speeds (around 1/5 of a second with a 50mm lens on a D800), I was able to get a higher number of steady shots than I was able to when shooting handheld, but I still saw some motion blur in many of my images. Shooting at more moderate shutter speeds (around 1/50 of a second with a 135mm lens on a D800), I was able to significantly reduce the motion blur in my images while shooting with the monopod as compared to shooting handheld. In my opinion, I’d use a monopod much more for shooting video than still photos. Handholding and shooting video is never a good idea, but a tripod just won’t work in all situations. This is where a monopod is ideal. Video that I shot with the monopod compared to handheld was much more steady. Panning was also smoother. In short, watching it didn’t make me feel nauseous the way watching video that was shot handheld can. 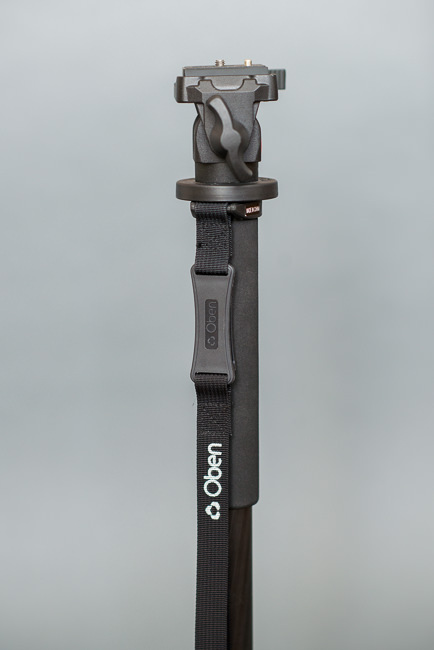 The Oben CTM-2400 4-Section Carbon Fiber Monopod and VH-R2 tilt head are a great combination if you plan on shooting video in an environment where you’re moving around and don’t want to use a tripod. It’s also great if you need to drop the shutter speed below your comfort zone for a particular lens, but it is no replacement for a tripod if you’re shooting at very low shutter speeds. It adjusts quickly and securely and includes some useful features such as a wrist strap and belt clip. 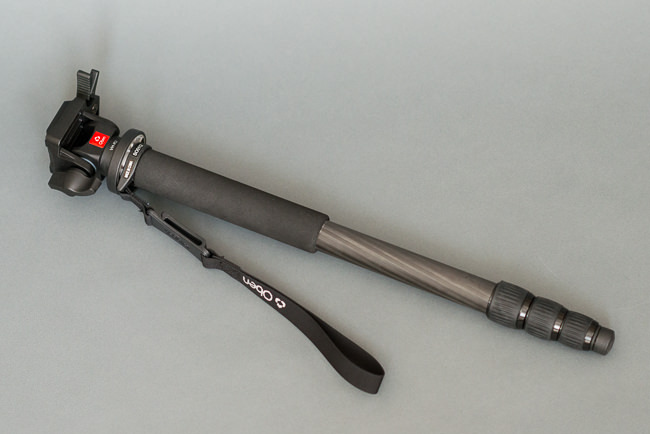 The size and weight of this monopod make it very easy to take with you almost anywhere. 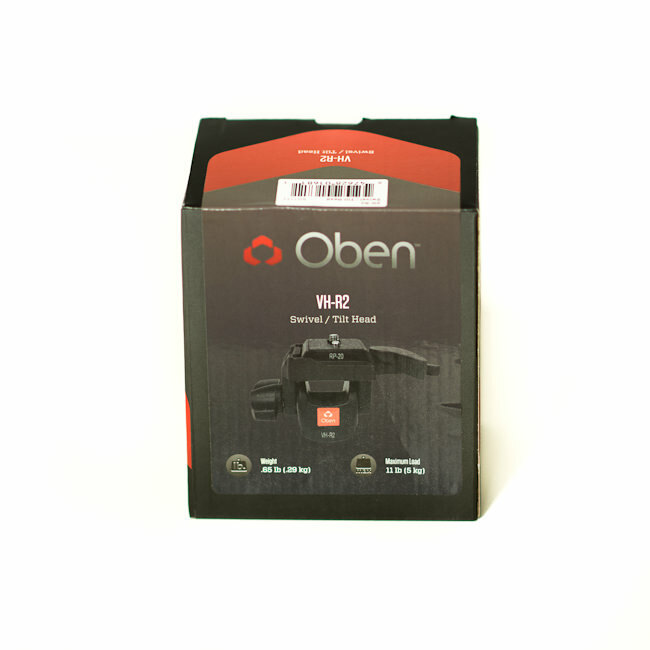 The Oben CTM-2400 4-Section Carbon Fiber Monopod is priced at $146.95 and is available at B&H Photo Video.